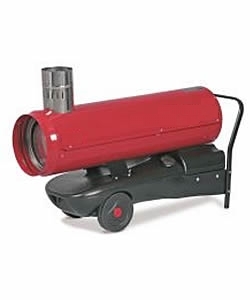 High Quality Diesel Heater capable of use with 230V or 110V supply. 99000btu output. Thermostatically controlled Very high output diesel powered heater. Suitable for any applicaton where tremendous heat is required very quickly. Ideal for heating large marquees, warehouses, or any large space which requires heating quickly and economically via trunking venting through a defuser..